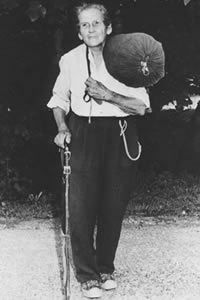 In 1955, after raising 11 children, Emma "Grandma" Gatewood became the first woman to solo thru-hike the Appalachian Trail - at the tender age of 67! Then, in 1960, she hiked it again. And, just to prove those first two weren't a fluke, she hiked it again in 1963 - at the age of 75! After that third adventure Emma became the first person to hike the trail three times. Some claim Gatewood was a pioneer of ultralight backpacking. She never carried more than 20 pounds of gear or food. She wore Keds sneakers, and carried an army blanket, a raincoat, and a plastic shower curtain in a homemade bag slung over one shoulder. According to Appalachianhistory.net, she simply didn't believe in expensive state of the art paraphernalia. “Most people today are pantywaist,” she once stated. Wow, what would she think of today's generation?!?! To celebrate this hiking pioneer, Eden Valley Enterprises is working on a project to produce a documentary about her life. The documentary will be produced by Peter Huston of FilmAffects. WGTE (PBS Toledo, Ohio) has agreed to be their broadcast sponsor and production partner for the film. However, the project will cost money to get off the ground. Eden Valley Enterprises is spearheading a Kickstarter campaign to raise $3,500 in seed money before approaching larger corporations and foundations for help with the lion's share of the production costs. For more information on the project, and to donate, you can visit the Kickstarter campaign website. You can also find additional information on the Eden Valley Enterprises website as well. Overall Appalachian Trail speed record holder, Jennifer Pharr Davis, released her brand new hiking guide book today. Five-Star Trails Asheville: Your Guide to the Area's Most Beautiful Hikes explores the best 35 trails in and around Asheville, NC. The book provides in-depth trails descriptions, directions, and commentary on what to expect along the way. Each hike features an individual trail map, elevation profile, and at-a-glance information, helping readers quickly find the perfect hike while in the Asheville area. Jennifer is also the author of Becoming Odyssa: Adventures on the Appalachian Trail and Best Hikes Near Charlotte. With today being Cyber Monday, I wanted to ask everyone, if you're planning to purchase anything from Amazon, REI or Backcountry.com this Holiday Season, to please shop from our store. You get the exact same great prices as if you went directly to their websites, plus you help support HikingintheSmokys.com as a free resource for hiking trail information in the best national park in the country! 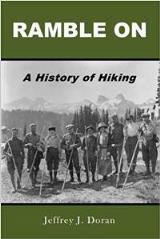 To see our complete libary of hiking and travel guide books for the Smokies and the surrounding Southern Appalachian Mountains region, plus maps and other gift ideas, please click here to visit our Amazon affiliated store. Thanks for all your supports throughout the year! Celebrate Christmas in the mountains with old-time music, harp singing, storytelling and reminiscing, craft demonstrations such as weaving, spinning, quilting, bark berry basket making, historic toys and games, and children's activites. Enjoy an old-fashioned Christmas celebration in the Smokies with traditional music. Earlier in the summer the National Park Foundation announced a new interactive website feature called Trail Talk, which provides an opportunity for the public to get an insider’s perspective on a national park - from the experts themselves. Every two weeks, NPF features a different national park on their Facebook page. Fans of NPF then have the chance to submit any and all questions they have about that park. Trail Talk rounds-up the questions, and then presents them to one of the rangers in that park. Back in August, Bob Miller, spokeman for the Great Smoky Mountains, was the focus of Trail Talk. Ranger Bob offered readers some of his favorite hikes, as well as his three “can’t miss” activities in the park, among several other questions he fielded. You can read the entire Q & A here. Looking for some gift ideas, or maybe just trying to find a simple stocking stuffer for that outdoor lover in your life? 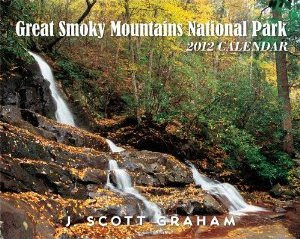 Let me offer a few ideas that would make any hiker or fan of the Great Smoky Mountains a happy camper on Christmas morning. This is great way to enjoy a glass of wine after a long day on the trail! The PlatyPreserve is the best way to protect the taste of an opened bottle of wine by completely eliminating the presence of oxygen. While alternative methods might have you pump air out of the bottle or inject gas into the bottle - PlatyPreserve has you transfer your un-finished wine into an air tight reservoir to truly protect the taste of your wine so it may be enjoyed several days or even weeks later. The Don't Die Out There Deck, a compact deck of playing cards that tucks easily into any backpack or pocket. From construction of emergency shelters and evacuation techniques to how to care for someone with a fracture or construct a solar still, your poker hand contains basic survival tips that could prove lifesaving! The Don't Die Out There Deck makes a great gift for anyone who spends time in the outdoors. Perfect for a family camp-out or an evening around the fireplace, Bears! is a fast-moving dice game for two to four players, ages 7 and up. Who will survive the rampage? And who will be eaten by bears? Each turn, when the bears come roaming through camp, players must choose to run, shoot or take a chance and sleep through it all. * Save Up to 50% Off on 10,000+ Items - and - Free 2-Day Shipping on Orders Over $50 at Backcountry.com (from Black Friday through Cyber Monday). * Altrec Outdoors is offering Up to 60% Off - from Black Friday through Cyber Monday. * The North Face Buy/Get Deal – Get $50 bucks off the rest of your order with any $200 North Face purchase. Only from Altrec Outdoors. Deal ends 11/28/11. * Buy one, Get 2nd item at 50% off on Men’s, Women’s, Kids’ & Footwear at REI-OUTLET. Through 6 p.m. MST on 11/28/11, You can save up to 50% or stay free one night, get a Free lift ticket with 3-night lodging reservation, and get Free ski rentals at select resorts from Mountain Reservations. To see our complete selection of books and trail maps releated to the Smokies and the surrounding region, well as other gift ideas, please visit our online Amazon affiliated store. Managers at Great Smoky Mountains National Park announced plans to close the 11-mile Cades Cove Loop Road to all vehicular traffic on Tuesday, November 29, and to impose a partial closure on Wednesday, November 30. During that time, Park forestry technicians will treat hemlock woolly adelgid (HWA)-infested hemlock trees with a horticultural oil sprayed from large truck-mounted units as they have been doing since 2004. During the full closure on November 29, only hikers will be allowed to travel the Loop Road. Bicyclists will not be allowed to enter the Loop Road for safety reasons since there will be heavy equipment on the road making it unsafe for bicycling. Park personnel will be working at the entrance and exit areas of the Loop. The spraying operation on November 30 will only impact the western end of the Loop Road. Motorists and cyclists will be able to enter the Loop as they normally would, but will have to detour across the Loop via Hyatt Lane (the second gravel crossroad) to exit Cades Cove. Hikers can continue through the closed portion. The detour will shorten the length of the trip to an 8-mile tour of Cades Cove. The Hyatt Lane bypass will eliminate access to the Cades Cove Visitor Center and Cable Mill area as well as the several trailheads located on the western end of Cades Cove: Abrams Falls, Cooper Road, Rabbit Creek, and Wet Bottom Trails, and Gregory Ridge trailhead. "In addition to spraying trees in developed areas, the Park is utilizing a systemic pesticide to treat some of the larger hemlocks in the spray zone. The systemic treatments move into the tree canopy with sap flow and can effectively control adelgids for 5-7 years which can be a more practical and cost effective approach to management. The spray acts as a quick knockdown allowing the systemics to catch up." The park employs a three-prong approach that also includes the release of predator beetles. All of the chemical and biological control techniques are showing positive effects in areas of these treatments, despite the noticeable decline of tree vigor and mortality throughout the Park. Currently about 600 acres are being sprayed annually, over 180,000 hemlock trees are being hand-treated with systemic pesticides spread across 4,400 acres, and about a half-million predator beetles have been released. In the event of heavy rain or freezing weather, the operation will be rescheduled. To check the status of the road closure, visitors can call the Park's general information number at 865/436-1200. Local and prolific writer, George Ellison, released his newest book today, High Vistas: An Anthology of Nature Writing from Western North Carolina & the Great Smoky Mountains. This new release is actually the second and final volume covering nature writings from the region. His latest book focuses on writings from 1900 to 2009, and includes well-known names such as Donald Culross Peattie, Roger Tory Peterson, James Fisher, Edwin Way Teale, Edward Abbey and Scott Weidensaul. The descriptions from these writers, and others, provide specific insights into the region's landscapes, flora and fauna, as well as a sense of wonder at its diversity and beauty. High Vistas, Volume I, released in 2008, covers writings from the region from 1674 to 1900, and includes essays from celebrated naturalists such as John Muir and William Bartram, as well as lesser-known writers, who describe how they went about exploring and depicting the region. 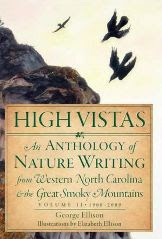 The two High Vistas volumes are the first anthologies devoted to nature and descriptive writing from Western North Carolina and the Great Smoky Mountains. Both books include original illustrations from George's wife, Elizabeth. Cyclists may want to make note of legislation in the U.S. Senate that could force cyclists off roads in some national parks. The draft of the Senate's transportation authorization bill, S. 1813 Moving Ahead for Progress in the 21st Century Act, includes language that would introduce a mandatory sidepath law on roads in our National Parks and other Federal lands. What precedent does this set? Two pretty awful ones come quickly to mind: why stop at Federal land highways; and if roads with higher than 30 mph speed limits are so unsafe for bicyclists to share with motorists, bicyclists shouldn’t be using them, period. You can read his full analysis on this piece of legislation here. The League of American Bicyclists is also organizing a petition to strip this language out of the bill. Thanks to the National Parks Traveler for alerting me on this one. The Great Smoky Mountains recorded another significant decline in visitors last month. Compared to the same month last year, visitation to the park in October declined a whopping 9.5%. Strangely, October is one of the busiest months of the year because of the fall foliage, and this year ranked as a very good year for fall colors. * Kennesaw Mountain National Battlefield Park in Georgia has recorded 2.3 million visitors for the YTD, a jump of 56%! * Gulf Islands National Seashore in Florida, with 5.1 million visitors so far this year, has seen an increase of 25.5%! * Blue Ridge Parkway also recorded an increase of 5.2% versus the first 10 months of 2010. However, parks nearby the Smokies have fared just as badly, or worse. Shenandoah National Park has seen a decline in visitation of 4.6% for the year, while the Big South Fork is down 10.8%. So what to make of all these numbers? I don't know what the exact numbers are, but I would say that a large percentage of Smokies visitors come from the area directly surrounding the park. In particular, from the Knoxville area. With the bad economy that we've had to endure over the last three years, my guess is that many people in the surrounding area have spent their vacation/recreation time nearby in order to stretch their dollars as far as possible. Many of those people in 2011, I'm guessing, decided it's time to do and see something else, with the beach sounding like a pretty good option. Anybody have any other insights? The folks at Wilderness Wildlife Week have announced the hiking schedule for the upcoming annual event, which will take place during the week of January 7-14, 2012. You'll also have the opportunity to get closer to nature with your choice of more than 50 guided walks and hikes this year. Some of the highlights on this years' schedule include Mt. Cammerer, Ramsey Cascades, Albright Grove, the Original Road to Walker Sisters, a Llama Trek along Big Creek, as well as a couple of off-trail hikes to Greenbrier, Meigs Mountain and Round Top. You can check out the full hiking schedule by clicking here. This week the USDA Forest Service in North Carolina announced plans to conduct prescribed burns near the areas of Max Patch and Harmon Den in Haywood County, as well as near Dobson Knob in Burke County. All three burns will occur between now and early December, depending on the weather. The Forest Service’s Appalachian Ranger District of the Pisgah National Forest plans to burn a total of 950 acres on National Forest land in two separate prescribed burns. The Forest Service will burn approximately 500 acres in the Cherry Creek area. The boundary is Harmon Den Road to Cherry Creek Trail. A 450-acre prescribed fire is scheduled to occur in Max Patch. The boundary line will be Max Patch Road to Buckeye Ridge Horse Trail. The Forest Service’s Grandfather Ranger District of the Pisgah National Forest plans to burn approximately 1,250 acres on National Forest land. The boundary of the burn is Forest Service Road 106 to the north and the rest of the burn will be bordered by the Black Fork and Yellow Fork Creek. There will be a small section of handline (built with handtools similar to a trail) that will connect FSR 106 to Yellow Fork Creek. The prescribed burns will reduce the amount of hazardous fuels in the forest, improve wildlife habitat, and maintain fire-dependent and fire-adapted species. Who inspires you to enjoy the outdoors? What program or people are breaking new ground and getting people active outdoors? The Outdoor Industry Association would like to recognize these individuals and organizations with an Outdoor Inspiration Award. The outdoor trade organization is now accepting nominations for individuals, groups or companies that inspire the enjoyment of, participation in and support for outdoor activities. They're looking for personal stories of achievement, encouragement and insight that truly stand above the crowd. If you know an employee, volunteer, customer, athlete, teacher, leader, community, school, fund raising group, guide service, product development team, sales force or company that has motivated or inspired you and others, now is the time to publicly recognize them. Nominations will be accepted through December 16, 2011, and the winners will be announced at the Outdoor Retailer Winter Market in Salt Lake City, Utah. For more information, including all the nomination guidelines, please click here. Hiking enthusiast and local author Danny Bernstein will lead a four-mile hike along the Mingus Creek Trail in the Great Smoky Mountains in next month. Along the way Bernstein will discuss the historic Mingus Mill, the Mingus family cemetery and a slave cemetery. The hike is considered to easy to moderate in difficulty, and has a total elevation gain of 700 feet. Hikers should come prepared with food, water and appropriate hiking gear for the all day excursion. Hikers will also visit the new Oconaluftee Visitor Center, featuring interactive exhibits that tell the cultural history of life in the Smokies. The guided hike will take place on Tuesday, December 6th. A donation of $25 to go to the Friends’ Smokies Trails Forever program is requested, and includes a complimentary membership to Friends of the Smokies. There is no cost to current Friends of the Smokies members. For more information, please click here. Win a Chance to Be a Gear Editor for Backpacker Mag! Backpacker Magazine is looking for two exceptional men, and two exceptional women, who share their fascination with new products, cool gear, and upcoming trends. If selected, you will become an elite member of the inaugural Backpacker Reader team and will be sent on assignment to Outdoor Retailer Winter Market, 2012, in Salt Lake City to write, blog, photograph, and maybe even star in a video or two at the world’s largest outdoor industry trade show.....the Mecca for all things gear and gadgets for the upcoming retail year. Your job will be to give Backpacker readers a behind the scenes perspective on upcoming new gear and new trends. If interested, all you need to do is create a compelling video and send Backpacker a writing sample: a blog-type entry that describes one of your favorite pieces of gear and why you think it’s so cool. To learn more, click here. "Clingmans Dome in Tennessee. I got there just after sunset. There was this afterglow in the Smokies. You could see the lights of Gatlinburg and Pigeon Forge. Usually there are a lot of tourists, but I was up there all alone. It was still and silent." That quote is from Jennifer Pharr Davis in an interview on the National Geographic website. The North Carolina native has been named as a nominee for National Geographic's Adventurer of the Year for setting the speed record of 46 days, 11 hours, and 20 minutes on the Appalachian Trail earlier this year. For seven years, National Geographic has combed the globe to find Adventurers of the Year, each selected for his or her extraordinary achievement in exploration, conservation, and adventure sports. You can vote for Jennifer by clicking here. Last week we officially launched our brand new trail website: HikinginGlacier.com. If you haven't been to the site yet, we provide details on more the 60 hikes in Glacier. To find any given hike we use four directories to help you can find trail by area of the park, difficulty, payoff (great views, waterfalls, lakes), as well as an alphabetical listing. The new site is modeled after our HikingintheSmokys.com website. Hopefully you'll find this helpful if you ever plan to visit to Glacier. After sending out a press release last week, we had several blogs and news sites post our news. I just wanted to thank the National Parks Traveler, KTVQ in Billings, KPAX in Missoula, JAGS Report, Oh, Ranger!, and ABC of Hiking for publishing the news and a link to our website. I also wanted to let you know that I will be making revisions to the HikingintheSmokys.com website over the next several weeks and months - as time permits. My goal is to clean up some formatting issues, give the site a cleaner look, and maybe add more content / information relative to some of the trails. If you have any suggestions on anything I could do to make the website better, (design, navigation, content, trail data, etc..), please let me know. Simply place a comment on this posting. Today marks the release of a brand new book from local author Bob Plott, a third-great-grandson of Johannes "George" Plott, who first brought the Plott bear hounds to America in 1750, and a great-great-nephew of Henry Plott, who introduced the breed to the Great Smoky Mountains in 1800. 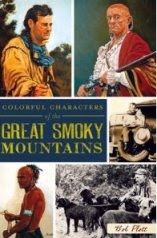 Amid the rocky crags and misty hollows of North Carolina's Great Smoky Mountains grew a generation of hardy and fascinating characters whose lives became the stuff of legend. Discover the tale of the bold Captain Kennedy and his ragtag band of Mohican and British comrades, who became French and Indian War heroes; how Henry Von Plott became a renowned bear hunter and breeder of the world's premier hunting dog; and the story of Yonaguska, considered to be the last truly great chief of the Cherokee Nation. Join Von Plott's relative and prolific local author Bob Plott as he weaves the lively stories of these vibrant characters and their lasting legacy on the people who will always call the area home. This past Thursday the Blue Ridge Parkway concluded their series of meetings regarding their proposed General Management Plan. The plan will guide resource management at the park for the next twenty years. In essence, the Blue Ridge Parkway's preferred plan seeks to reinvest in the parkway's aging infrastructure, update inadequate visitor services and facilities, and protect a biologically diverse natural environment. Some of these plans will have an impact on hikers and campers. “Throughout the Parkway’s 75 year history, most of the 199 secondary roads that cross at-grade have not had a significant impact on the park, as they have been largely rural and lightly travelled. Growing pressure for secondary road improvements could jeopardize the future of the park in the form of adjacent land development and increased non-visitor commuter traffic along the Parkway," said NPCA Program Manager Chris Watson. Public comments on the General Management Plan will be accepted through December 16th. For more information, please click here. Tennessee State Parks recently announced that they will be offering special winter rates for 360 villas and cabins, along with six state park inns, from Nov. 1, 2011, through March 31, 2012. With a Tennessee State Park within an hour’s drive of just about anywhere in the state, families and groups seeking unique recreation opportunities and high-quality accommodations can find the perfect getaway – all at an exceptional value. With a Tennessee State Parks special winter discount, park visitors can stay at one of Tennessee’s six state park inns for $49.95 a night (excluding tax). The inn discount may be used seven days a week and applies to both individuals and groups. At participating inns, guests may add the breakfast package for an additional $10. A 50 percent discount also is being offered for villas and cabins with a two-night minimum stay. The cabin discount is valid Sunday through Thursday only and some holiday weeks are not included. Discounts are based on availability and certain other restrictions may apply. There is no coupon necessary for this special rate and patrons simply need to ask for the “Special Winter Promotion” when making a reservation. When making online reservations please ensure the available code for the special winter rate or cabin discount is applied. While reservations are not required, they are highly recommended to ensure availability. Earlier in the week the U.S. Forest Service unveiled a comprehensive series of maps that illustrate for the first time the crucial role forests play in sustaining the watersheds that are most important to the quality of American surface drinking water. The Forests to Faucets project will also help identify watersheds where a payment for watershed services project may be an option for financing conservation on forest lands. The cost of treating drinking water increases 20 percent for every loss of 10 percent of forest land in a watershed. As Washington policymakers await action by the Congressional Super Committee, the nonprofit National Parks Conservation Association (NPCA) released a new report yesterday titled “Made in America: Investing in National Parks for Our Heritage and Our Economy,” which details how national parks and visitors could be impacted if the Super Committee fails and mandatory across-the-board cuts are made to the federal budget. The report also finds that investing in national parks not only protects our national heritage, but is critical to supporting the livelihood of businesses and communities across the country. The report focuses on 12 parks as case studies, including the Great Smoky Mountains, Blue Ridge Parkway and Cumberland Gap. The report mentions that the Smokies has become the fifth-largest beneficiary of volunteers in the National Park System, with 2,400 volunteers donating 124,000 hours to the park in 2008 alone. They also mention that the adopt-a-trail and adopt-a-campsite programs have been particularly important in maintaining the park’s 800-mile trail system. Ten years ago, the Blue Ridge Parkway had 240 permanent positions to manage the scenic drive. Today, BRP can afford to fill only 170 of those, leaving a third of the maintenance department unstaffed. As the federal deficit reduction committee approaches its November 23 deadline, NPCA is calling on Congress to make wise investments in programs that are economic drivers for communities nationwide. If the committee fails, the process of sequestration could result in across-the-board discretionary cuts of 9 percent—a cut of about $231 million for our national parks. This would unquestionably be devastating for many national parks, visitors, and the communities and businesses that depend on them. “Of course we need to fix our deficit problems. But cutting national parks budgets will have about as much impact on the deficit as a bucket full of rocks would have on filling the Grand Canyon, and it would cost jobs, hurt communities, and mar our national heritage,” said Obey. According to a recent NPCA study, every federal dollar invested in national parks generates at least four dollars of economic value to the public. National parks support $13.3 billion of direct local private-sector economic activity and 267,000 private-sector jobs. Cuts to park operations, construction and land acquisition could mean direct job losses and impair the places that American families rely on as affordable vacation destinations each year. Recent polling shows that 85 percent of voters surveyed favor giving national parks enough funding so they are fully restored and ready to serve the public for the next 100 years, as evidenced by the more than 100,000 people who recently signed a petition calling on Congress to protect park budgets. I fully support properly funding our parks so that they can continue to operate. However, given the dire nature of our national debt and the budget situation, one has to wonder why we continue to expand the National Park System. Just this past week two new parks were added to the system: Fort Monroe National Monument and Paterson Great Falls National Historical Park. Right now 4% of the NPS budget is allocated towards land acquisition. 10 years ago, it was 12% of the budget. I understand that many of those dollars over the years have been used to purchase lands adjacent to existing parks, etc. But many of those dollars were used to purchase brand new parks and monuments. To me this appears to be highly irresponsible. If I were drowning in mortgage debt, I likely wouldn't be adding new rooms to my house. I'll repeat what I've said in the past. I think parks should be allowed to become more creative in raising revenues that they are allowed to keep, instead of sending them back to the general coffers in Washington DC. Furthermore, I think we need to look at all 397 units of the National Park System and determine how many really belong, how many are truly worthy of national status, how many are truly profitable for the surrounding communities, how many can be absorbed and managed by state and local communities, how many could become privately protected such as Monticello (Thomas Jefferson's home) as an example. Is anyone in government doing any of this critical analysis before justifying more expenses for the American taxpayer? To view a full copy of the report, please click here. A humorous look at a serious subject from the "Howcast" series. Does anyone else think the claymation figure looks a little like Bill Clinton? For more in-depth information concerning hiking with bears and what to do if you come in contact with one on the trail, please click here. As many regular readers are already aware, my wife and I spent more than five weeks in Glacier National Park back in August and early September. Since returning I’ve posted several blogs about our hiking adventures. What I didn’t mention was the reason why we spent so much time out there. Today we’re proud to announce the launch of our brand new hiking website: HikinginGlacier.com. During our time in Glacier we hiked to most of the destinations that hikers would cover in a day hike. In doing so, we logged about 250 miles. The result of all that hiking is a website that covers more than 60 hikes in Glacier. Similar to Hikinginthe Smokys.com, our new website provides directories that make finding a trail much easier. We include directories of trails by location within the park, trail feature, difficulty rating, and by alphabetical listing. Along with all of the most popular hikes, such as Iceberg Lake, Grinnell Glacier, Hidden Lake Overlook and the Highline Trail, we discovered some new favorites, such as Piegan Pass, Preston Park, Gunsight Lake, Virginia Falls, Pitamakan Pass, Ptarmigan Tunnel, and the absolutely incredible Cracker Lake. In addition to being a great source for trail information, we designed the site to be an excellent tool for vacation planning as well. We’ve included a lot of travel information that will be helpful to vacationers. 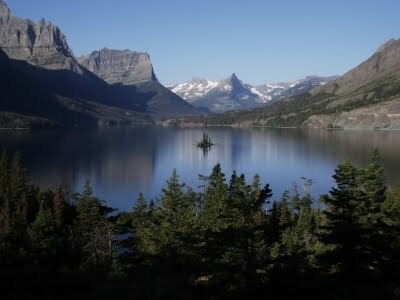 Even if you have no plans on traveling to Glacier, I hope that maybe you’ll enjoy some of the photographs on the site. If you know of anyone planning a trip to Glacier, or any hikers in general that may be interested, please feel free to forward the website onto them. Back in April of 2010 officials from Cherokee National Forest announced a project to rehabilitate the historic Pinnacle Mountain Fire Lookout Tower near Johnson City, TN. In late October of this year, the tower was officially reopened during a ribbon-cutting ceremony. The 40-foot tower is located atop 3520-foot Buffalo Mountain on the Unicoi and Washington county line in the Cherokee National Forest. It was built by the Civil Conservation Corp in the early 1930s, and served as a fire sentinel for the Cherokee National Forest until 1989. Another component of the rehabilitation project was the development of a 5-mile trail, known as the Pinnacle Fire Tower Trail, that connects the Pinnacle Mountain Fire Tower to a trailhead on property owned by the Town of Unicoi near the base of Buffalo Mountain. The Pinnacle Mountain Fire Lookout Tower is one of only three federally managed fire towers that remain in the northern Cherokee National Forest. Meadow Creek in Cocke County and Camp Creek Bald in Greene County are the other two. For more information on the project, please click here. For more information on the tower, including photos, please click here. NPS Digest is reporting that stop sticks were used on Newfound Gap Road to stop a man fleeing from rangers last week. Last Wednesday morning, November 2nd, supervisory park ranger Bobby Fleming contacted a man in a parked vehicle in the Chimneys Picnic area. While talking to the man, Fleming saw drug paraphernalia in plain view and ordered the man out of his vehicle. He refused to do so, and instead, sped away at a high rate of speed. A pursuit ensued down Newfound Gap Road and north towards park headquarters and the Sugarland Visitor Center. Gatlinburg PD officers and district ranger Steve Kloster joined the chase. Kloster placed stop sticks on the highway just south of the Little River Road – New Found Gap Road intersection. The man swerved onto the shoulder, but the stop sticks still caught and flattened his left front and rear tires, which began to shred. He continued driving on the rims for another mile before stopping. After being taken into custody without incident, several charges were filed against the man. Others charges are pending. For several years, the park has prepositioned stop sticks at its three main entrances. In 2011 the park purchased more of them for patrol vehicles and ranger stations. In this incident the stop sticks were critical in ending the pursuit quickly without a motor vehicle accident or injuries to anyone involved. Leanna Joyner, AT thru-hiker, amateur historian, and author of “Hiking Through History: Civil War Sites along the Appalachian Trail.,” will be speaking at UNC Asheville’s Highsmith University Union Grotto next week. “Hiking through History” enables hikers to speculate about trailside murders and mysteries which provide a glimpse at how mountain communities experienced the Civil War. The event will occur at 6:30 p.m. on November 15th, and is free and open to the public. For more information, click here or call 251-6415. National Geographic News just posted a pretty interesting story about how coyotes are breeding with wolves in the Great Lakes area, and are now moving southward. These "hybrids" migrated east into New England, and have moved down the Appalachian chain and into Northern Virginia. A DNA study published in the Journal of Mammalogy last month, "found evidence that Virginia coyotes have mated with Great Lakes wolves but not with the rare red wolf, which is hanging on in just a few isolated spots in the U.S. South." Interestingly, the report also mentions that a third of the coyote-wolf hybrids diet is from deer. You would have to think that they'll eventually make their way into the Great Smoky Mountains at some point. You can read the full article here. If weather permits, the Great Smoky Mountains will be conducting prescribed burns in Cades Cove between Monday and Thursday of this week. The Loop Road will remain open, but delays may be possible. Fires may be visible from the roadway and visitors may encounter smoke in the valley and along the roadway. Temporary closures of the Primitive Baptist Church, the Methodist Church, and Abrams Fall trailhead are also possible. Also, as a reminder, the Cades Cove Loop Road will be closed for two days during the week of November 28 - December 2 for hemlock woolly adelgid spraying. Spray operations are weather dependent. Exact dates will be posted once they are determined. If you plan to visit the Daniel Boone National Forest in Kentucky over the next several months, you may be asked to participate in a national visitor use survey. The U.S. Forest Service just announced that they will be conducting surveys to determine the recreational interests of its visitors. The last visitor survey conducted on the national forest was in 2007. This survey found, through more than 2100 participants, that the top five activities were hiking, fishing, viewing natural areas, driving for pleasure and boating. For the new survey, personnel will be stationed at developed and dispersed recreation areas throughout the forest. Visitors should look for signs that say “Traffic Survey Ahead.” Participants will not be required to give their name or address, only a zip code. Participants must be 16 years or older. The average survey time takes less than 10 minutes. The visitor surveys in the Daniel Boone National Forest will continue through September 2012. Keep food in secure containers and do not leave food unattended. * If you encounter a bear – never run. Back up slowly and make noise so the bear knows you’re there. These are a few safety tips. The USFS offers a more detailed safety checklist for black bears. Earlier this week Tennessee State Parks announced its annual free state park day for all Tennessee veterans on Friday, Nov. 11, offering one free night of camping and complimentary greens fees for 18 holes of golf with appropriate identification. Passed by the General Assembly in 2010, the policy calls for a yearly, special state parks day to honor Tennessee’s resident veterans. The free day on Nov. 11 is in addition to Tennessee State Parks’ current veterans’ policy, which includes a camping discount within the state parks system and is available annually beginning November 1 through March 31, offering a 15 to 25 percent reduction off the standard nightly base rates (depending on the type of site chosen). This camping discount is available to Tennessee residents showing proof of prior military duty. A special state park discount also is in place for active duty military personnel and members of the Tennessee National Guard. This year-round discount is given to all U.S. military – regardless of their branch of service or where they are stationed. Disabled veterans also are eligible for the Tennessee State Parks year-round ADA discount that provides a 25 to 50 percent discount for campsites. For more information about Tennessee State Parks’ veterans and military discounts, please visit www.tnstateparks.com/FAQs.shtml#military. To receive the free state park day benefits and extended discounts, veterans need to provide proof of residency with a Tennessee driver's license; and proof of veteran’s status, with a Certificate of Discharge (DD214) or Veterans Administration benefit card. The Bandy Creek Visitor Center in the Big South Fork National River and Recreation Area will be changing to new hours for the late fall and winter seasons. In the interest of better serving visitors travelling from the Central time zone, the Bandy Creek Visitor Center will be open from 9:00 a.m. until 5:00 p.m. Eastern Time each day beginning Sunday, November 6, 2011. The visitor center will be open every day except for Christmas Day, December 25. The park is open for use every day of the year. Days may be shorter and the weather cooler, but the Big South Fork has a great deal to offer during the winter months. To find out how you may continue to enjoy the Big South Fork in the coming months, call the Bandy Creek Visitor Center at (423) 286-7275. The U.S. Forest Service announced yesterday that they will be waiving fees at most of their day-use recreation sites over Veterans Day weekend. The fee waivers - the third this year - are offered in cooperation with other federal agencies under the Federal Lands Recreation Enhancement Act. Day-use fees will be waived at all standard amenity fee sites operated by the Forest Service. Concessionaire operated day-use sites may be included in the waiver if the permit holder wishes to participate. Traditionally, fees are not charged on 98 percent of national forests and grasslands and over two-thirds of developed recreation sites in national forests and grasslands can be used for free. Many recreation opportunities such as camping, sightseeing and hiking can be enjoyed throughout the year at no cost. The Forest Service operates approximately 17,000 recreation sites nationwide. Of those, approximately 6,000 require recreation fees, which are used to provide visitor services, repairs and replacements, and facilities maintenance. NASA recently released a series of new satellite data visualizations that show tens of millions of fires detected worldwide from space since 2002. The visualizations show fire observations made by the MODerate Resolution Imaging Spectroradiometer, or MODIS, instruments onboard NASA's Terra and Aqua satellites. The short video below takes viewers on a narrated global tour of fires detected between July 2002 and July 2011. The fire data is combined with satellite views of vegetation and snow cover to show how fires relate to seasonal changes. The Terra and Aqua satellites were launched in 1999 and 2002, respectively. > Backcountry.com is now offering a FREE Mountain Hardwear Advance Lightweight Zip Top - valued at $45.00 - when a purchase is made on one of more than 20 different Mountain Hardwear products. Click here for details. > The Nantahala Outdoor Center (NOC) has some killer deals on out-of-season apparel. They're offering discounts up to 63% on clothing, footwear and outdoor gear from Mountain Hardwear, Chaco, NRS, Keen and more. This sale ends on November 9th. * Get an Extra 20% off at Sierra Trading Post. Use code AVSNOW1. Valid Nov 3 to Dec 7. * Take 25% off Orders of $125 or more or 30% off $150 or more at Sierra Trading Post. Use code AVNOV1. Valid Nov 3 to Dec 7. Click here for more information. Shenandoah National Park Superintendent Martha Bogle announced yesterday that portions of the Skyline Drive, the famed mountain road through Shenandoah National Park, will be closed at night during hunting season. She noted that this is the thirty-first year that this closure has been undertaken and stressed its importance at reducing illegal hunting activity within the park during the Commonwealth's hunting season outside the park. From November 14, 2011, through January 8, 2012, the Skyline Drive between Front Royal (Mile 0 at U.S. Highway 340) and Thornton Gap (Mile 31 at U.S. Highway 211), and between Swift Run Gap (Mile 65 at U.S. Highway 33) and Rockfish Gap (Mile 105 at U.S. Highway 250), will be closed daily between 5:00 p.m. and 8:00 a.m. The central portion of the Drive, between Thornton Gap and Swift Run Gap, will remain open for overnight access to Skyland Resort and Big Meadows Campground until those facilities close on November 27. Then, beginning November 27, 2011, through January 8, 2012, the entire length of the Skyline Drive will be closed daily from 5:00 p.m. until 8:00 a.m. Superintendent Bogle also reminded the public that the park has a reward program to assist in combating illegal hunting in the park." A reward will be paid to anyone who furnishes information which leads to the conviction of any person who hunts, transports, or attempts to transport illegally taken wildlife within the park," said Bogle. Anyone with information about such activities should call the park (toll free, 1-800-732-0911; or (540) 999-2227). The identity of persons furnishing information will be kept strictly confidential, and a person does not have to reveal his or her name. For any boaters in Virginia it might be a good idea to get your *Virginia boating license*. * Backcountry.com is giving away a Free baselayer, valued at $50, on all Mountain Hardwear DRYQ Elite purchases (while supplies last). For more information, please click here. * Also, for any skiers out there, Mountain Reservations is offering one night free in Winter Park, Colorado. Travelers can get a third or fourth night Free when booking at Beaver Village Condominiums for stays between 11/16/2011 to 4/22/2012. You must book by 11/19/2011. They have 150 listings for this property, including one and two bedroom units from $120 per night. Click here for more information. * From Milepost 232.5 at Stone Mountain Overlook to Milepost 236.9 at Air Bellows Gap Overlook. Detour traffic signage will direct visitors around closures via NC Route 18 through Sparta and Laurel Springs. Click here for a map of the detour. The Historic Stone Guardwall Reconstruction Project (Milepost 217 to Milepost 245) involves 28 miles of the 469 mile-long Blue Ridge Parkway and contains 32,000 linear feet of historic rock masonry walls. A significant portion of the walls are severely deteriorated due to settlement and the effect of freeze-thaw cycles over the past 75 years. This project rehabilitates and reconstructs the most deficient wall sections. The Blue Ridge Parkway is recognized worldwide as an international example of landscape design achievement. Designed and built to provide a leisurely recreational driving experience and showcase the scenic resources of the central and southern Appalachian Mountains, this section of the Parkway displays the historic rock walls that line the motor road. Constructed during the late 1930s, these rock walls are now an important historic Parkway resource. Built in the rustic style used throughout other American national parks, the walls are a significant feature that defines the visual and historic character of the Blue Ridge Parkway. This project will restore the structural integrity and historic appearance of this important cultural resource. Blue Ridge Parkway management regrets the inconvenience or delay these closures may cause Parkway visitors. This Thursday evening the Little River Trading Company will be offering a Long Distance Hiking Clinic. Bert (Wildcat) Emmerson, a "Triple Crown Holder" who has thru-hiked all three US long distance trails; the AT, Pacific Crest Trail, and Continental Divide Trail, will be giving a clinic on long distance backpacking. The event will be held this Thursday, November 3, from 7:00pm - 10:00pm at the LRTC store at 2408 E. Lamar Alexander Pkwy in Maryville. The LRTC asks that you bring your gear and logistic questions for Bert. For more information, please click here. The leaders of the Great Smoky Mountains two primary partner organizations were recently presented with the Department of Interior Citizen’s Award for Exceptional Service. Terry Maddox, executive director of the Great Smoky Mountains Association (GSMA), and Jim Hart, president if the Friends of the Smokies, were recognized for the outstanding support to the Smokies and the National Park Service. Since 1990 Maddox has lead the GSMA, the non-profit corporation which provides education to Smokies visitors and material support to the park through sale of interpretive media at park bookstores and through wholesale marketing of these products outside the park. Under his leadership the association has grown from a small book retailer to a major author and publisher of APPL award-winning educational products, including books, field guides, maps, videos, podcasts and web-based material. This publishing capability has enabled GSMA to create a series of guide books on topics such as birds, forests, churches, wildflowers that are specific to the Smokies rather than generic publications available in most bookstores. In the 20 years of Maddox’s leadership, support to the park has grown from just over $350,000 annually to more than $1.8 million. Most recently, the association provided $3 million to construct the new Oconaluftee Visitor Center, the first dedicated park visitor center in North Carolina and its only cultural history museum. The grand opening of the visitor center was in April of this year. Hart has served as president of the park’s philanthropic/fundraising partner, Friends of the Smokies, since 2002. Under his guidance, the group has substantially increased the public’s awareness of the value of the park and the various threats, such as the destructive hemlock woolly adelgid, which threaten its future protection. Other benefitting programs include the “Parks As Classroom” program, which now serves over 10,000 K-8 students, and the hosting of over 50 high school and college age interns. Over the nine years of Hart’s tenure, Friends of the Smokies donations have swelled from about $1.8 million a year to over $3.5 million. Their total support since their founding in 1993 now stands at over $33 million. The groups provided a portion of the financial support needed to build the park’s new Leadership in Energy and Environmental Design-certified (at the gold level) Twin Creeks Science and Education Center. More recently, they also funded the $500,000 cost of designing and fabricating all the maps, exhibits and other informational media needed to equip the Oconaluftee Visitor Center. They have also created a new “Trails Forever” endowment which is approaching $4 million. The endowment is funding a new trail crew dedicated to expanding the park’s trails program from routine annual maintenance of the status quo of trail conditions to taking on a series of labor-intensive trail improvement projects that will reverse the deterioration of park trails.